Approaching the net is something that a lot of players do only when absolutely forced to. And that’s a mistake, because an assertive volley, a well-timed net rush or an aggressive chip and advance are all tools they a great player should have in their skill set. These techniques and shots allow players to dominate points by picking and choosing when they will play them. In addition it puts your opponents off balance and forces them to hit a lower percentage shot to try and pass you. The result is that volleys are great shots to minimise the length of points, accelerate your path to a clean winner and ultimately win matches. So why do most players feel more comfortable deep behind the service line, rather than making the most of the opportunity to play positive tennis from the net? The answer is that the net shots are far more variable than groundstrokes, and mean that players have to adjust much more in their approach and contact height than would otherwise be the case. With that in mind we’re going to look at some basics for great net play that you can use in your next training session, and hopefully your next game! 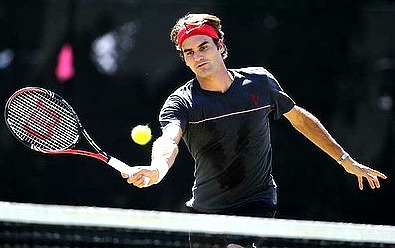 The reason many players spray their volleys wide is not executing a simple adjustment to their grip as they approach. Because you choose when to volley (usually) you also have the chance to chance your grip proactively, rather than reactively. The best all round grip for a solid net play is a continental grip. This means that the base of your hand and your knuckle are more rounded and about a quarter of the way around the racquet handle. The reasons for the switch, even if you hit all your groundstrokes with an extreme western or modified grip is that you need to have the strings and face of the racquet facing the ball at contact. Further, this grip is an all round grip at the net which allows both the forehand and backhand volley to be played with ease. This is crucial because at the net your reaction time is much less than what it is deeper in the court, and you won’t be able to adjust your grip specifically for a particular shot once you’re there. An important part of approaching the net is executing a good split step that leaves you able to lunge and step in either direction. A forehand volley is on your “near” side so you are sometimes able to hit a pure “arm” shot where you stick your racquet out to where the ball will be and allow the power of the shot to make your return for you. While this is sometimes effective, it’s not a good habit to fall into, because you sacrifice the ability to place your shot. Apply the same fundamentals as a groundstroke and rotate your shoulders toward the shot. Also, allow your wrist to recline back a little, to absorb the power of the ball and give you more feel for the shot. The shot itself is little more than a catch and push and should be accompanied with a step off the left foot (for right handers) toward the net to give you some forward momentum toward the ball. Your arm should also be firm yet not tight through the shot to give you that extra power without the need for a follow through. Much of what we just talked about with the forehand is also true here, with the split step, footwork and shoulders moves all similar. However, the need to have your body moving toward the ball in unison is much more crucial here because the ball is on your “far” side, with far less time to prepare. The other crucial difference is that because you are reaching across your body to make the shot, the racquet naturally angles up. To counter this, you do not lay your wrist back as you do for the forehand, instead hitting the ball slightly in front and with a slight downward punch to counteract the rise of your hand. Again, focus on catching and pushing the ball so as to absorb the speed of the ball. For both shots it’s important to not ball watch after you make contact. As soon as you’ve hit it, you need to think about your set up for the next shot by moving your racquet back to centre and rotating your shoulders back to face the net, otherwise you risk being exposed with a lot of court for your opponent to aim at if they make the return. Also take a short step back as stepping into your last volley will likely leave you very close to the net. Developing a solid net play takes time and practice, but for that reason, many players are unable to counter opponents who do it well, which gives those who are able to do so a great advantage in matches. From "The Fundamentals of Solid Net Play" To "How To Play Tennis Efficiently And Become A Better Player"